June 13, 2016 – Today, we’re spinning back in time to the days when America tore itself apart: The Civil War. 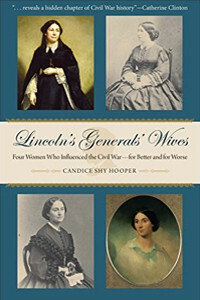 But we’ll be talking about a different sort of union, exploring the bond between the men who led the northern armies, and the women by their sides in Lincoln’s Generals’ Wives: Four Women Who Influenced the Civil War — for Better and for Worse. With 70,000 books on the war produced since its end, it’s incredible that Candice Shy Hooper is the first author to map the wartime travels of Julia Grant, Nelly McClellan, Jessie Fremont, and Ellen Sherman. But to borrow the chapter title from today’s book: “The woman who is known only through a man is known wrong.” Candice is just the person to give us the full picture of these engaging figures, and how they interacted with their powerful husbands and Abraham Lincoln as president. You can learn more at CandiceShyHooper.com.